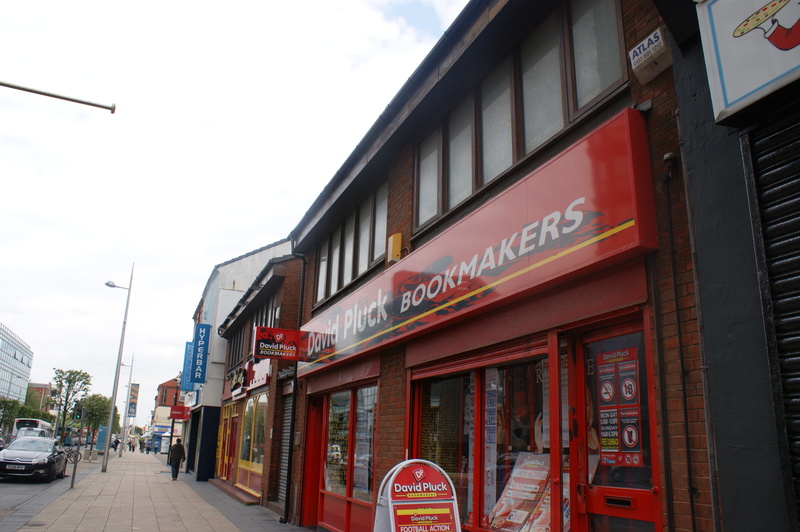 The fantastic five storey building was built in 1911 as a theatre and described as “artistic throughout”. 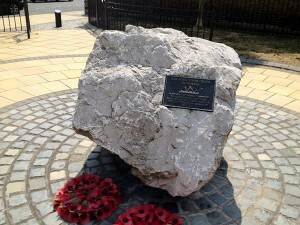 It was built by the Pennington family who also built the Muncaster Theatre on Irlam Road Bootle. It was designed in a Renaissance style by established Theatre architects Havelock Sutton & Sons of Liverpool. 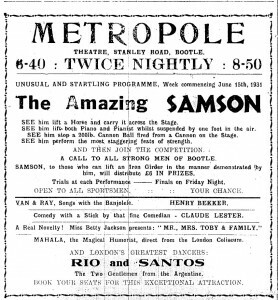 For several years the Metropole showed a number of popular variety acts and performances, ranging from orchestral and musical acts to comedy and revues. The huge 1850 seat auditorium was a very popular and grand venue. 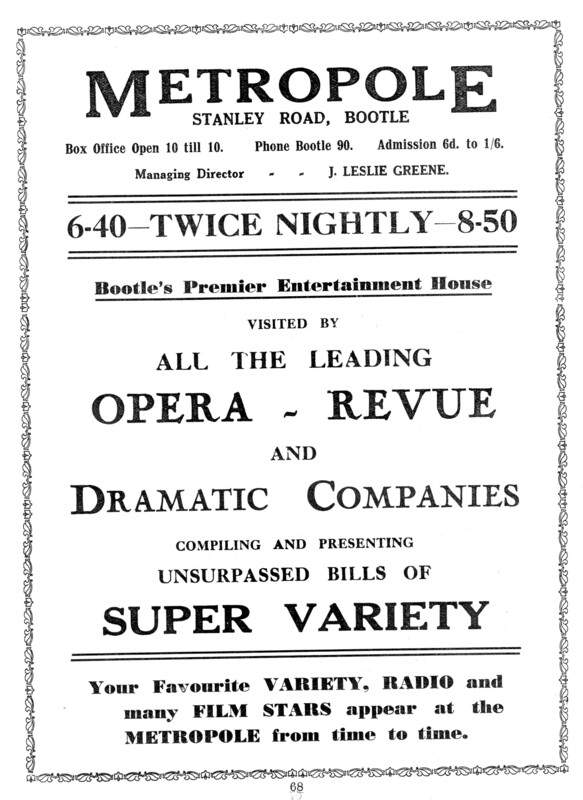 In 1922 the Metropole changed hands of ownership and a new company called Bootle Metropole Syndicate took over operation and spent thousands of pounds on improvements to the building including new carpets, upholstery and decoration. As the popularity in films grew the Metropole Theatre underwent further alterations to become a place for showing sound films. 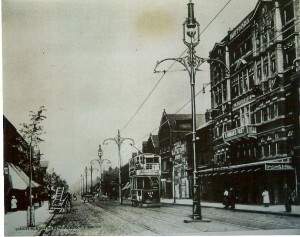 In 1931 major alteration works took place to adapt the building, seating was reduced in order to make room for the projection room and a Western Electric Sound System installed. 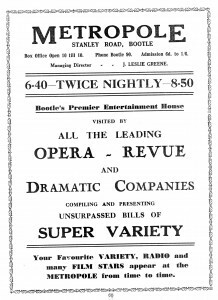 The grand reopening of the Metropole took place on the 3rd August 1931 with the films being ‘The Lottery bride’ staring Jeanette Mcdonald and ‘Framed’ starring Evelyn Brent. On stage entertainment was provided by La Grande Revuette et Cie. 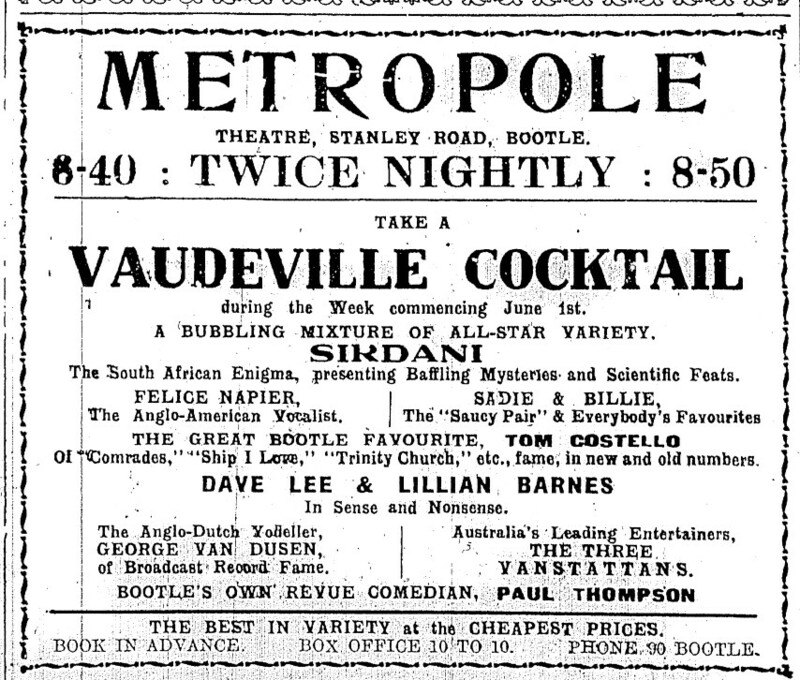 The Metropole continued to show an unusual mixture of cinema and variety entertainment and was a popular local venue. 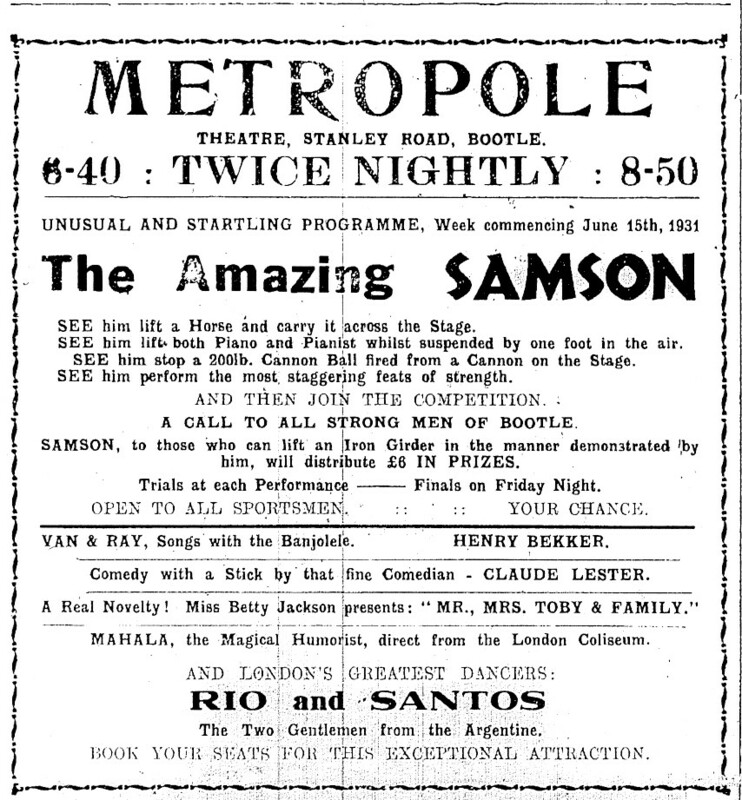 The advert below shows the variety of entertainment at the Metropole calling for the strong men of Bootle to take up the challenge of Samson. 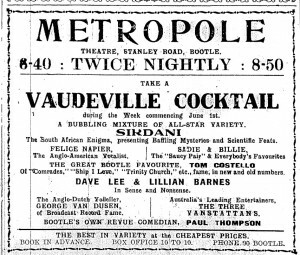 During the years leading up its closure, The Metropole hosted a mix of both moving pictures, variety performances, revues and comedy acts. 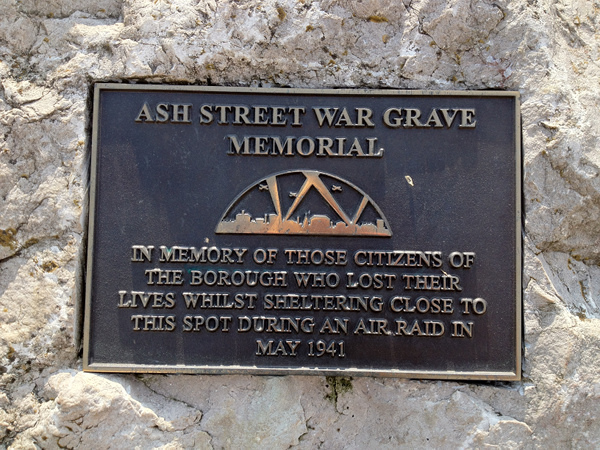 It reopened as a venue for film shows on 5th May 1941, 2 days later the building was destroyed during the Blitz on 7th May 1941. 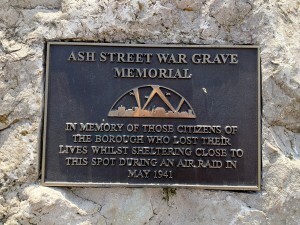 Around the corner from the site on Ash Street a war memorial is erected in memory of those that lost their lives in the area during the blitz.